The camp, sponsored by the LASP-affiliated Institute for Modeling Plasma, Atmospheres, and Cosmic Dust (IMPACT) with funding from NASA’s Solar System Exploration Research Virtual Institute (SSERVI), is designed to reach students who don’t typically go into fields like aerospace, including women and minorities. Almost all of the middle school students are Latino and have parents who never attended college. Lozano Roman said six students from Casa de la Esperanza are now in college, including two studying mechanical engineering at CU. “They’re the first generation in their family to go to college,” he said. A group of CU Boulder undergraduate and graduate students, known as Science, Technology and Astronomy Recruits (STARS), is helping the middle school students learn about the solar system. 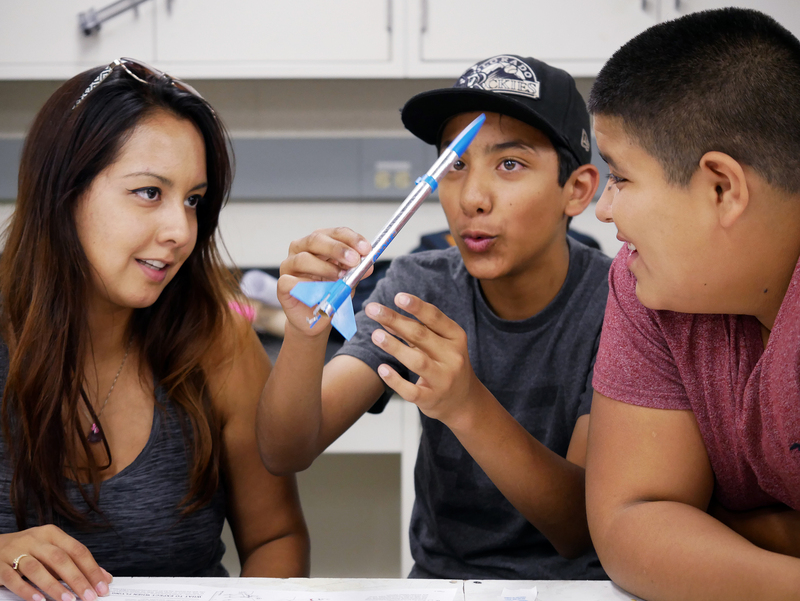 The STARS students are focused on encouraging underrepresented populations to study science. “We want to help the students see themselves as scientists,” said Andrew Sturner, a graduate student in astrophysics. Michael Nothem, a CU Boulder undergraduate in engineering physics who works with the STARS program, said he attended an inner-city high school in Denver and knows what a difference it can make for students to meet a scientist. The capstone of the summer camp will be when the students launch a 6-foot rocket they helped build. That launch is now scheduled for Aug. 20 in a rural area southwest of Pueblo, CO. The rocket should soar to 5,000 feet and carry a container of honey, to test the effect of the launch on the honey’s viscosity. A small army of military stick figures with tiny parachutes will also be ejected from the rocket. Most of the kids enrolled in the current summer camp also attended a previous camp LASP sponsored two years ago. Mason said the kids came back because they enjoy learning about science and being exposed to the scientific research at CU Boulder.